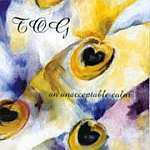 Review: "Tog: An Unacceptable Color" - Sea of Tranquility - The Web Destination for Progressive Music! An Unacceptable Color by the computer music duo Tog (Robert Duckworth & Roddy Schrock) is the most brutal collection of electronic noise you are ever likely to hear. As cacaphonous as death metal or free jazz, as abstract as avant-prog, these two create eight tracks of sonic chaos that to the ears of many will certainly not resemble anything close to music. Comprised of live improvised and studio recordings, An Unacceptable Color shifts from tragic ambient and atmospheric sounds to thunderous mayhem at the drop of a hat. Electronic music has never sounded so dangerous, so ugly, and yet so interesting. Who knew that experimental computer music could be so facsinating and yet so primitive all at the same time? At times you will feel like you are inside a spaceship soaring through the stratosphere battling enemy crafts, at others the blips and beeps will lull you into an intoxicated coma. On ocassion the frenzied electronic levels are so loud and piercing that you will be tempted to cover your ears or hit the stop button, but then quickly things always change scope and move in a different direction. Definitely a unique experience. Not for the faint of heart or for anyone who appreciates music with melody and structure, Tog's new CD surely can find a home with fans of electronic , ambient, or avant-garde genres.